Eddie Tealer, current vice president of business services at North Lake College, has been selected as the next Eastfield College president. The Dallas County Community College District Board of Trustees voted unanimously Oct. 3 to appoint Tealer’s after Chancellor Joe May nominated him Sept. 28. The search for the next Eastfield president started last spring when Jean Conway announced she would be stepping down from the position. Tealer visited campus Sept. 11 for an open forum. 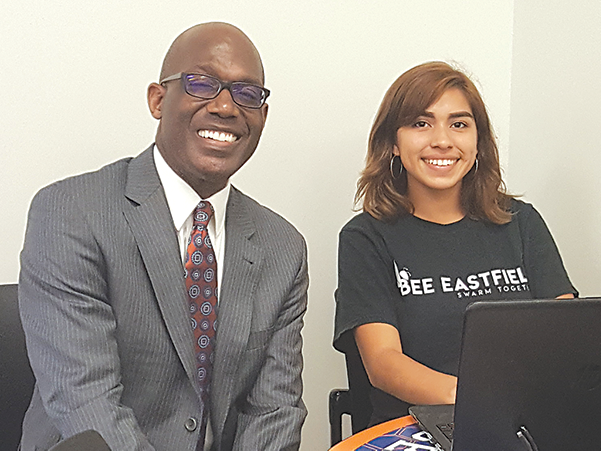 He said one of the first things he wants to do when he takes the position as Eastfield’s president is introduce himself to the executive team, the faculty association and students, whether they are at lunch or in the halls. Tealer earned his doctorate in leadership studies from Our Lady of the Lake University in San Antonio. During his 10 years with the DCCCD, Tealer has worked in finance at the district level and at North Lake College and has experience in the private sector. He currently teaches a doctoral course about American community college at the Southern Methodist University. He has worked with chambers of commerce, the Irving Independent School District and Mobility Credit Union. Tealer said at the Sept. 11 forum he has a strong relationship with people from Eastfield who he works with at the district level and has an understanding of the college from that perspective. “I think before I set any new goals, I would like to listen and see what some of your goals might be and some of the things that you might want to approve of,” he said. Tealer earned his doctorate in leadership studies from Our Lady of the Lake University in San Antonio and is currently the vice president of business services at North Lake College. The other candidates for the job were: Kim Armstrong, vice president of student affairs at College of theOuachitas in Malvern, Arkansas; Sharon Davis, vice president of business services at Mountain View College; Carmen Walters, executive vice president of enrollment management, student success and institutional relations for ten Mississippi Gulf Coast Community College locations.